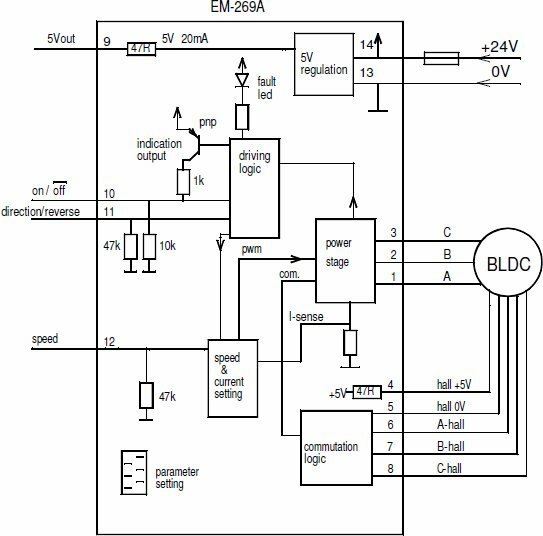 EM-269A is brushless DC-motor driver for motors with hall sensor feedback. The unit has a mosfet power stage with good efficiency and it meets also todays EMC requirements. The unit has the basic digital command inputs like direction, start/stop, and analog input for speed control. Device has one NPN output for fault and overcurrent indication use. Indication output functions can be defined with parameter. The fault situations are also indicated with on-board LED. There are two control options for speed. Direct control ( open loop ) sets motor voltage in propotion to control voltage as with a standard DC-motor. Closed loop mode uses hall sensor feedback for speed control. This mode offers good speed regulation. Start and stop ramps are working in both mode. Speed adjust range, closed loop rpm range and ramps can be set with parameters. Analog input is filtered, so that also PWM signal of PLC can be used to control speed. Parameter setting can be done digitally with EM-236 interface unit or with Emen-Tool lite PC-programand EM-268 adapter. There is also an option to use iPhone with Ementool-APP and EM-326 adapter. The Parameters settinfg are stored into driver's nonvolatile memory . The parameter interfaces can be also used for motor current monitoring. Driver card can be installed in DIN-rail base and some enclosure options are also available. 0-1V or open = "off" / 4-30V = "on"
EMC measured for industrial and household env.